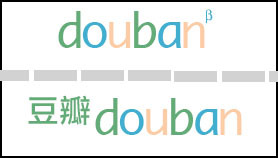 Lyn pointed an article out to me on China Web 2.0 Review this morning that mentioned an English version of 豆瓣 Douban (think Flickr interface + books/movies social bookmarking; touted as a leader in China’s Web 2.0). Content as well as membership are stored separately on each site, probably for language-related logistical reasons. My question is, will they be allowed to overlap (socially) in the future for those who read both Chinese and English? Next post Douban.net, cont. Be part of a bridge space.